Don't forget to come back and leave a comment on Friday's post. Let me know what you've taught to another person either online or in person for a chance to win! 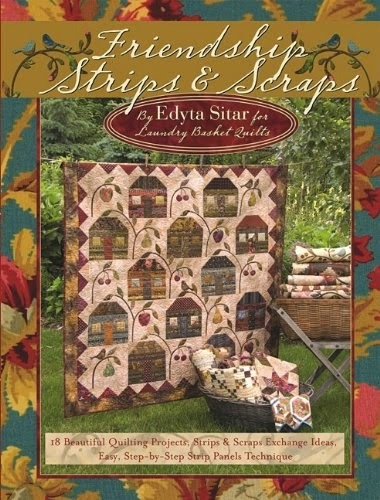 The prize is an unused, new book by Edyta Sitar called Friendship Strips & Scraps. I'll ship anywhere in the world so all can enter! This Saturday is the second of a yearlong series of classes of my EPP Mystery class. I have had such a fantastic time designing the blocks for this quilt. I'm now working on the layout and borders. I can hardly wait until Saturday to to see all of the color variations of January's block. Once everyone gets January's and February's blocks done, the comfort level of working with the three shapes will be easier and easier. My mantra for the year is FUN, FEARLESS, and FANTASTIC. We are working with the following shapes: hexagon, triangle, and diamond. The blocks are created and then appliqued on either a light or dark background fabric. Some students in the class are planning on using both light and dark backgrounds in the quilt. How fun is that! I'm sticking with the light background on mine but will utilize the dark background fabric in the borders. Stay tuned....I'll post pictures after the class. It is so Spring-like here in Oregon and everything is in grow mode and blooming. Today, we may reach 65 degrees! If we have the cold spell they are expecting mid March, it could be devastating. I heard that the local growers are already separating plants in an attempt to avoid massive losses. Not sure what I can do here at home, but I was gifted some large recyclable bags from my local pet store today so I have enough to at least cover my blueberry plants if needed.